The GPS tracking system and window tint were not listed anywhere in the vehicle description on the listing. When I spoke with the dealer sales rep he made it sound like these were required installations, which I thought sounded odd. Anything here look unusual? ask the dealer. If they can't explain what the fees are and whether or not they are optional and why, buy a car somewhere else. Can't think of a reason why a $1,000 anti theft system fee would not be optional, though it may be part of their own 'insurance' on a vehicle that has a lein on it, in case of repossession. Is it a conventional GPS/NAV system, GPS vehicle-tracking, or LoJack? If LoJack, that is a aftermarket tracking system which allows police to track (and find) your car if it is stolen, and which is added, per owner-request, to a number of new vehicles today. For general GPS-tracking just for tracking-sake, though, that violates privacy-laws in many states, and is illegal to add to a vehicle unless ordered by a court for a previous driving-offense. I take it that you have a clean record, and have not been convicted of anything serious....so I don't know why they would add a GPS tracker per se. If it has a stock nav system, wouldn't that include it's own tracking system? If so, there would be no need for another one. Overall, I don't like all the added on junk. You can do window tinting for less, and you absolutely do not need any sort of extra warranty on a late model Lexus. I'd also be curious how this dealer got ahold of such a car. Usually they stay in the hands of new car or Lexus dealers. Be sure to ask about the history of it. Thanks for the responses. The way it was explained to me is that it is a GPS tracking system for antitheft purposes. I didnt request to have it installed nor was it listed in the vehicle listing decription. Sounds like they're trying to upsell me something there. My dad always tells the dealer to remove those bogus fees. Did it work with Honda? No. For me, it worked with BMW, and his last car was a Buick. What he does is he says he will get the tags himself, maybe next week when he has time. The dealer wants the car gone now. So they register it. Thing is, my dad is serious, it's not a bluff. He is willing to do the DMV himself to avoid upcharges. When I bought the Lexus used from a new car dealer, they charged me around $270 for the registration. BUT, the amount that was over the actual amount, was returned to me by check, by NYS law. In this case, since the dealer was 2.5 hrs away it would have been very inconvenient for me to go back to PA with the title then return with a plate. And when I say "actual amount," the auto tag place charged around $40 plus $12 for FedEx. So I could have saved maybe $52 or so in reality. no, a nav system only receives satellite info. an anti-theft system must be capable of transmitting. Smog Fee Seller: $50 - don't think so if it's coming to GA? Total $36,536 - you're dreaming, right? Total with optional 4 yr warranty package: $39,535 - HELL to the no. that's also probably 4 years from new, i.e., "extending" to 4 years, not 4 more years. Wow seems they just kept adding on fees with your deal. I bought my GS used from a MB dealership. I refused to pay their flat "processing fee" considering car was in VA and I would have to get it registered, inspected etc...in MD. I walked out to my car then they came out running saying they can waive it. I paid cash and finance guy who was being honest for some reason showed me all the "add ons" they usually offer to customers and price including window tint, GPS, tire service all a bunch of BS to be honest that you can get done elsewhere. I bought my GS used from a MB dealership. I refused to pay their flat "processing fee" considering car was in VA and I would have to get it registered, inspected etc...in MD. I walked out to my car then they came out running saying they can waive it. 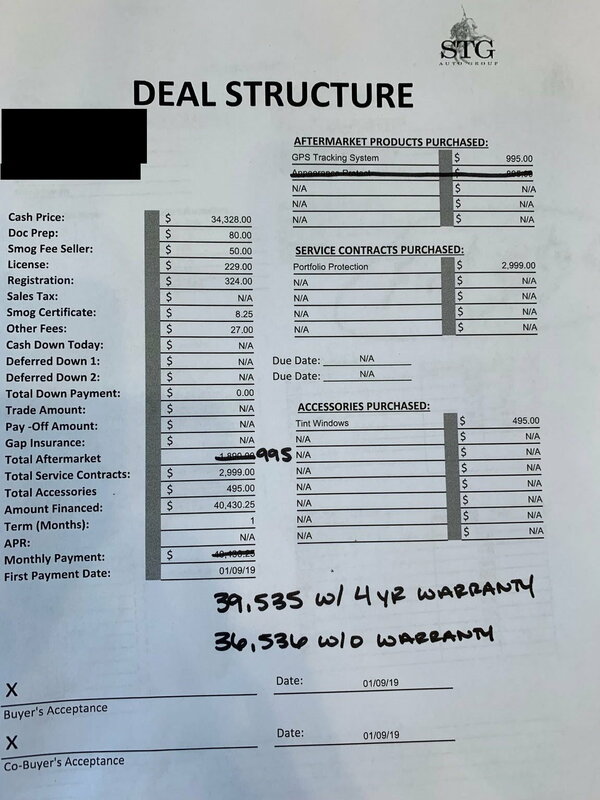 I paid cash and finance guy who was being honest for some reason showed me all the "add ons" they usually offer to customers and price including window tint, GPS, tire service all a bunch of BS to be honest that you can get done elsewhere. a bunch of bs is right... it's disgusting that most dealers standard practice is to try to rip off consumers with all kinds of things they don't need. i know the car business is tough but dealers selling practices richly deserve their foul reputation. I agree in part, and disagree in part. I assume, but do not know, that license, registration and smog certificate fees/charges are 3rd party charges the dealer must pay to the state. If so, they are legit. You could ask the dealer to eat them, but it's hard to get them to do that. But--if they mark up those fees, then push back. Ask for a state fee schedule. Also, there are 2 line items for smog; seems fishy. "Doc prep" is code for pure markup. The dealer's "preparation" is putting your info into the computer, and pressing "PRINT". $80 for that? Nope. GPS theft tracking? Tint? Just tell them you don't want those features. If they say you must take them, then you tell them you will take them "on the house". "Other fees"? C'mon now--they have to try a little harder to rip you off, don't they?? Everything in life is negotiable. Outcomes are somewhat predictable. Ever look closely at a cell phone bill and say, wait a sec, PA sales tax is 6%, but the amount next to the state sales tax line is 20%? The fine print actually explains and yes, it's a total rip off. But how many cos. do you really have to choose among for a cell phone if you want the best price and best network? 1.5? I did manage to get a iPhone Xs for $249.99 back in Nov. so some of that overpaying by everyone subsidized it. One guy in sales told me that psychologically? People tend to accept fees when a) they are pre-printed, b) they imply govt. involvement..yet a+b are often totally bogus.